When I started a Faithbox subscription three months ago, I was very excited to be receiving a box full of books and treats that would not only feed me spiritually, but financially support organizations that feed people physically. What I didn't think about was that I'd also be receiving a box every month. A sturdy, brown, wonderful box. So you have probably guessed what I do with them! 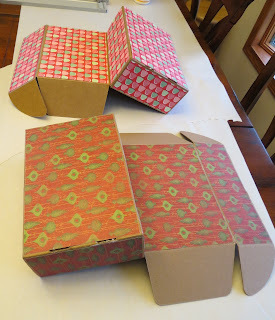 Instead of just recycling them, I upcycle them into some amazing reusable gift boxes! I start by removing all of the tape and labels. Then I cut individual panels of paper for each side. I leave the edges of cardboard showing through because I love that natural look. I haven't done a lot with Mod Podge except for my reversible holiday blocks, but it's incredibly easy. On cardboard, I applied a thin coat with a brush to serve as glue to hold the paper down. After it dried, just a couple of hours later, I brushed on another thin coat for sealant. Another couple of hours drying time and it was all set. Using all one pattern looks amazing, and next month I'm planning to try different patterns on each panel. I'm hoping it looks like a quilt - stay tuned! To add the ribbon, I adhered it first with glue dots and wrapped it around the flaps of the lid. There is still plenty of room to get the flaps tucked in, and it looks much neater than cutting it off on the lid. This technique will work with any sturdy cardboard, so take a look around the house. You'll probably find several boxes you could upcycle into reusable gift packages. Have fun!